A heady mix of haunting sights, awe-inspiring art and vibrant street life, Italy’s Eternal City is one of the world’s most beautiful and inspiring capitals. The soul of this ancient place is steeped in history while still being a metropolis that dazzles and inspires visitors time and time again. 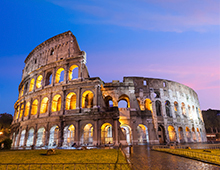 Italy’s capital, Rome, is a sprawling cosmopolitan city with nearly 3,000 years of globally influential art, architecture and culture on display. 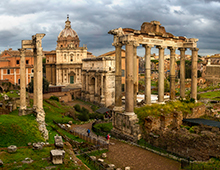 Ancient ruins such as the Forum and Colosseum evoke the power of the former Roman Empire. An autonomous state within the Italian capital, Vatican City is the headquarters of the Roman Catholic Church as well as a UNESCO World Heritage Site. 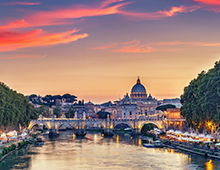 St. Peter’s Basilica houses masterpieces such as Michelangelo’s Sistine Chapel and frescoes while the city center is filled with wonderful palaces, millennium-old churches, grand romantic ruins, opulent monuments, ornate statues and elegant fountains. With so many sights and things to do, Rome is truly a global city which should be given due time to visit. For more information, please download your Stretcher Information Flyer. Our Travel Consultants can be reached at USA or CANADA: (800) 631-6277 or INTERNATIONAL: (415) 962-5700, option 1. Reserve early as space is limited and packages will likely sell out prior to deadline. Any unused space will be released early. DEADLINE TO BOOK IS MAY 15, 2019 OR UNTIL SOLD OUT! Just the name Monte Carlo conjures visions of glamour, million-dollar yachts, high rollers at the famed Monte Carlo Casino, Grace Kelly becoming the Princess of Monaco and Monaco Grand Prix. 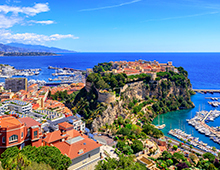 Today, Monte Carlo is a tax-free principality surrounded by France and the Maritime Alps. This cliffside Mediterranean port has been a timeless playground for the see-and-be-seen crowd for more than 150 years. But when you truly visit Monte Carlo you will be immersed in its history, culture and get to experience the slow-paced, yet refined, Monégasque savoir-vivre. Continue your adventure with us to Paris! 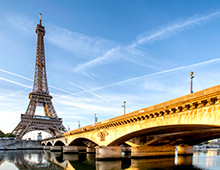 The capital of France, Paris’ 19th-century cityscape is traversed by wide boulevards and the River Seine. Beyond being known for landmarks such as the Eiffel Tower and the 12th-century, Gothic Notre-Dame cathedral, the city is known for its café culture and designer boutiques along the Rue du Faubourg Saint-Honoré. 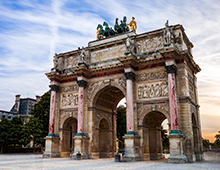 Paris’ monument-lined boulevards, culture, museums, bistros, and boutiques filled with styles that have put the city’s fashion prowess in the forefront of industry, is a must see at least once in your lifetime! Cancellation Policy: Olivia Companies, LLC is required to honor their contractual agreements with hotels, ground operators, and other outside vendors; therefore, the following cancellation fees apply: All Vacation Stretcher packages are non-refundable. A handling fee of $75 will be charged for any name changes to hotel and tour packages. Your booking/payment for vacation stretchers with Olivia Companies, LLC indicates your compliance with the above policies. While we do our best to confirm hotels and itineraries in advance, they are always subject to change. All Vacation Stretcher packages are non-refundable. Your booking/payment for vacation stretchers with Olivia Companies, LLC indicates your compliance with the above policies.